We like to make a difference ... little by little. This is why we set up Orzo♥Coffee! We wanted to create a social enterprise which on one side could help us spread the love for a long standing Italian tradition - caffe' d'orzo - in the UK, and by doing so, would allow us to support organisations and initiatives that make us live in healthier, happier and friendlier society. Cafe Art is a lovely London-based initiative exhibiting and celebrating the wonderful artworks created by homeless people, those who are socially vulnerable or those who have experienced homelessness. They are truly remarkable artists, and we want to share their talent and creativity with all you Londoners out there. Orzo♥Coffee has joined the Slow Food UK Supporters’ Scheme engaging with the UK food industry sector to support nutritional, sustainable and locally produced food. Orzo♥Coffee embraces the love for ‘slow food’. Like the Slow Food movement, Orzo♥Coffee comes from Italy and brings to the UK a taste for natural and healthy produce. 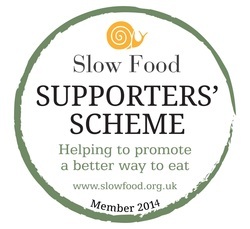 We hope many more small producers and local food companies will join the Slow Food Scheme and keep campaigning for the value of ‘Good, clean and fair food’ all these small steps can make a bit difference for healthier and happier communities in UK and abroad. Teen Veggie is a great initiative run and managed by some amazing teens. Their aim is to provide a platform and social network for teens to interact and share knowledge around vegetarian and vegan lifestyle choices. Their work and passion is amazing and we are sure they will go a long long way in making this a better world.